We constructed about 925 metres of new sewerage pipes in the Epping area to cater for future growth, and to reduce the likelihood of sewage spills during heavy storms. Between December 2016 and December 2017 our contractor, Azzona, built the new sewer pipe along the alignment of the future Edgars Rd extension, between Cooper St to the south and O’Herns Rd to the north. 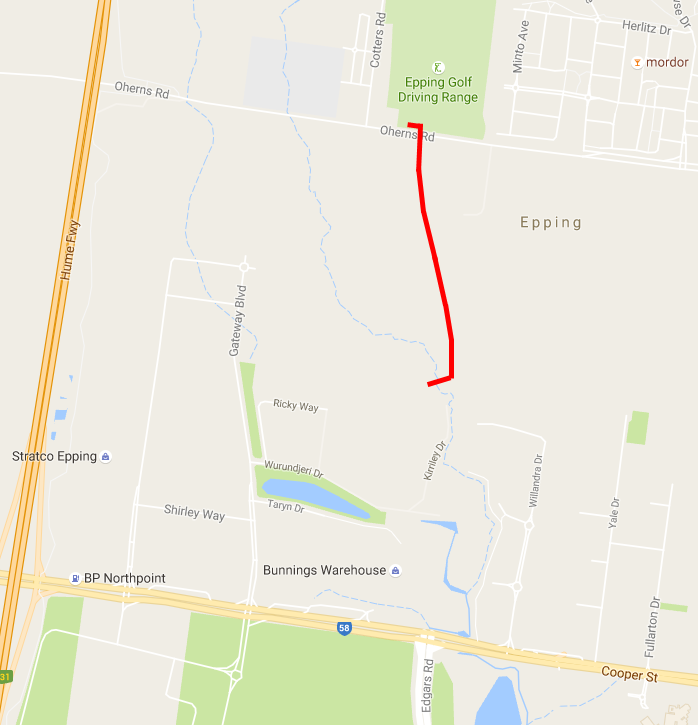 The new pipes are carrying sewage from the Epping area and from growth areas along the Hume Freeway, and transporting it southwards, connecting into the existing sewerage system that leads to Western Treatment Plant in Werribee. The red line represents where the new sewer pipe was built. In the future, once development of the area is complete, the sewer will be located in a road reserve, next to a four-lane, divided main road through a commercial/industrial development. However, as this is the first piece of infrastructure to be built on this alignment, Yarra Valley Water is required to offset the removal of the existing Golden Sun Moth habitat. We worked on the environmental aspects of this project with the Federal Department of Environment under the Environment Protection and Biodiversity Conservation Act (EPBC Act), and took the steps to mitigate the impact of habitat removal. If you have any questions, please contact the project manager, Leon Holewa, on 9872 1470.